Alrighty, time to get the season started. And here's a link to the speedweeks full schedule. fergy1370, 2 Sweet, Greg and 8 others like this. This is the first race of the year so if I made a mistake don't yell at me too loud. sdj, SlicedBread22 and Charlie Spencer like this. Bout time you got the ball rolling with this thread. klemmabyna and Johali like this. 2 Sweet, sdj and Johali like this. klemmabyna, sdj, dpkimmel2001 and 2 others like this. You like the thread that says 'Racing Forums Error - This page could not be found."? To each his own, I guess. I used to like test patterns and the EBS alerts. kkfan91 and SlicedBread22 like this. Ilovedthe90s and Johali like this. Liked it better the first time. SlicedBread22, Charlie Spencer and Johali like this. Kiante, Johali and kyle18fan like this. So ready! So no cars on track until Sat? For me, the Clash always marks the beginning of the season. Only 1/4 Midgets on Thur. and Fri and ARCA on Friday. Ok. Thought there might be a practice on Friday. Oh well. Almost here. race hub starts today ,cars on track fri,i think we made it though the off season. New year, same weather. I look forward to this weekend and attend every year and this never fails lol. Beats heck out of 12 degrees and 12 inches of snow. It's all relative. Mike Crayne, AdoubleU24, LewTheShoe and 1 other person like this. I remember one year that Ryan Newman had so many poles the year before that Autoweek magazine doctored a picture of the parade lap with Newman's car in all of the positions. 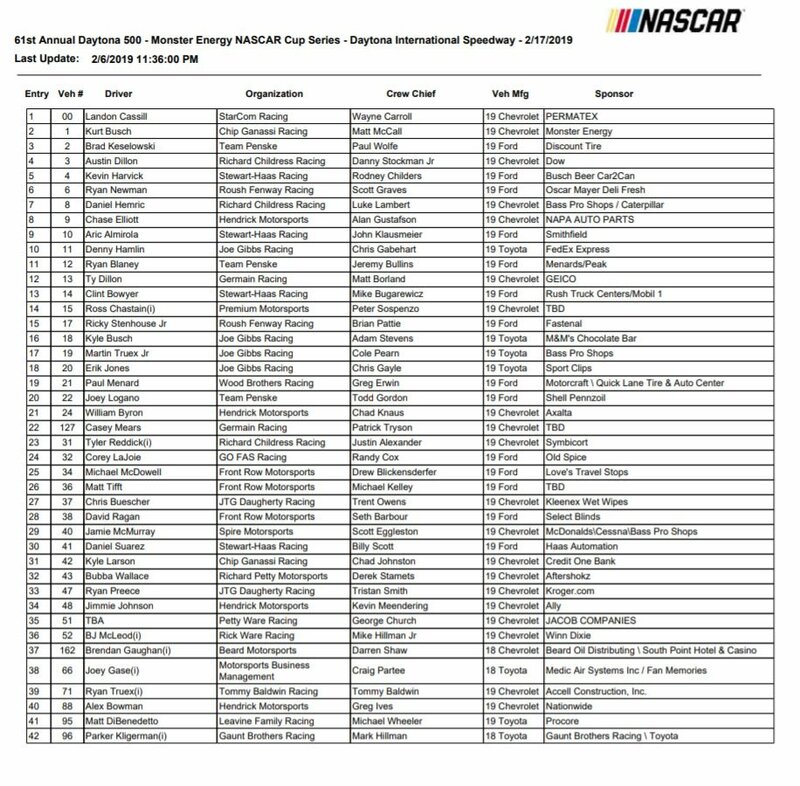 Daytona 500 entry list. Posting here because of Cup Practice on Saturday. Pat, StandOnIt and pjmolo like this. Curious as to where you found the entry list in that format. Click on the entry list link here. And It'll take you here. Pat, pjmolo and StandOnIt like this. Next weekend looks good as of now but it's 40% Tue-Fri so if that gets pushed back any there could literally be rain every single day of on track activity. Florida in February. Or anytime really. Charlie Spencer and AdoubleU24 like this. yeah that place where nobody has gone for years, Jayski is gone thanks to ESPN. Glad Racer has picked it up, as usual Nascar's is too clunky to share. This came from the fantasy cheat sheet website. I thought that it may be interesting to some. Notice Derrike Cope? This list consists of all active NASCAR drivers for the 2019 MONSTER ENERGY NASCAR Cup Series season. They should try to finish up the Rolex 24 tomorrow. that is after the race. They have to make the pit crawl pass thru drive of shame if the tent gets them.